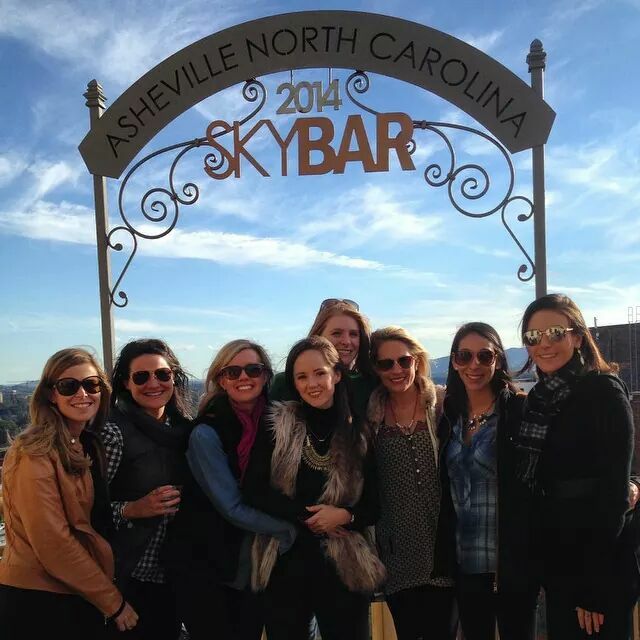 as you may have already read, i found myself up in asheville, north carolina for the first time this past weekend for a few days of fun to celebrate kristen’s bachelorette-ness. kristen and i were coworkers when i first started in software consulting back in 2010, and we have kept in touch since. she is such a sweetheart with a beautiful smile, and i am thrilled to get to celebrate her and joe up in blue ridge in november. but first! we had to host a getaway for the bride, and you can bet we did it in style. we all got a little shuteye after the trip north on friday evening and rolled out of bed saturday morning ready for a good time. we freshened up, called our ubers, and headed into town. we started with brunch/lunch at tupelo honey café. well, it was a fantastic recommendation, and if you live near one and haven’t been, shame on you! it’s a great spot and certainly worth the weekend wait. we donned our sunglasses on that crisp and clear autumn day and took a right on broadway to head to wicked weed brewing off biltmore avenue. my coworkers josh and philip highly recommended it, seeing as how they had spent several months up in this city for work. even our waiter at tupelo honey said to give it a try, so with support like that, that’s where we went. wicked weed brewing has a welcoming atmosphere perfect for big groups looking to have some afternoon or evening fun. they had fire pits going since it was a bit cooler that afternoon, and as we walked inside and wound downstairs, i found myself thinking it felt a bit like ormsby’s in atlanta, only with its own brewery downstairs. if you know me at all, you know i love ormsby’s, so i was excited for the visit. we found some space on the lower level patio after ordering our beers. they have an extensive selection at wicked weed, and as i later found out, this brewery focuses on hoppy ales and authentic belgian ales, which probably explains why i wasn’t too crazy about the pick me! pale ale: marco’s pick. i wanted to like it, but i just couldn’t finish my pint. i would rather have gone with the people’s choice ale, which i got to taste and liked a bit more. wicked weed is a great place to socialize and start off your lazy saturday afternoon. they’ve got tons of large picnic tables for gabbing, and even though i would have loved a few tv’s for some college football watching, it was nice to just hang out and get to know the girls. maryashley, alex, talia, cindy, meredith. 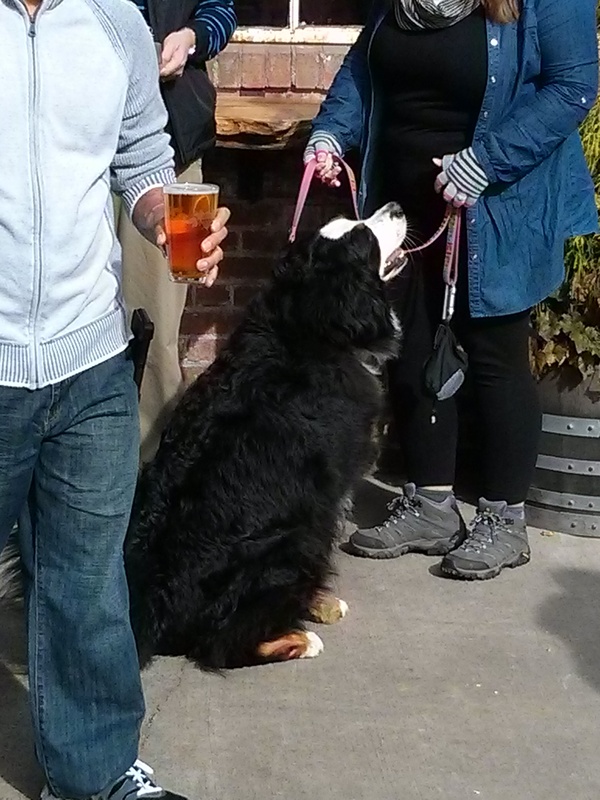 oh, and did i mention they’re dog-friendly? i mean, look at that pup. i unfortunately couldn’t convince anyone to create a diversion so that i could capture him and take him home. next time. next time. after a pint at wicked weed, the sky bar on wall street was the next stop. everyone hailed its killer views, so we of course had to check them out for ourselves. the friendly elevator attendant whisked us up to the top floor, lead us to the balcony, and left us to ooh and aah over the sight before our eyes. the scene is breathtaking from every angle. don’t you agree? meredith, all pensive and stuff. i wish the wind had not been so biting that afternoon, for i would like to have stayed for a drink or two. after the server snapped this photo (which might be my favorite of the trip), we huddled inside to bar ourselves from the cool air and then traveled downstairs to mg road per the attendant’s recommendation. alex, me, lindsey, kristen, cindy, maryashley, meredith, talia. we had asked for more of a lounge area where we could relax before dinner, and mg road was just what we needed right then. first, it wasn’t crowded at all, so we were able to take over an entire area with all the girls. the sofas and chairs were quite comfortable, so much so that had i been the least bit tired, i surely would have been enveloped in a cozy slumber. our server pat was knowledgeable and highly attentive throughout the early evening, patiently explaining the intricate drink offerings to us all. their liquor menu is almost never-ending, and you will surely be able to find something that fits your taste. i kept things simple with whiskey gingers all night, and they were pleasantly generous with the whiskey. if you’re looking for a good spot to relax after being on your feet all afternoon, mg road is the perfect place for you. 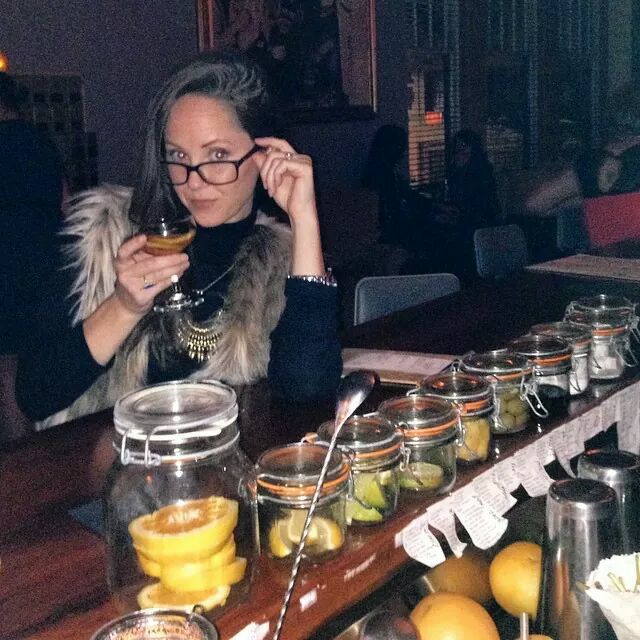 come here to recharge with a few cocktails and then hit the cobblestone streets of wall for your next adventure. our next adventure was quite close as we ambled across the street to the market place. talia had our reservation ready and waiting, and after a long afternoon of dense adult drinking, our stomachs were ready for some solid sustenance. the market place is a farm-to-table restaurant, and as you can guess, that was right up our alley last weekend. the chefs here do their “utmost to prepare and present fresh food in a creative manner with a craftsman’s hand. working in the most sustainable way possible is important.” to remain sustainable, the market place works with contributions from local farmers, ranchers, and brewers. and by supporting the community arts and education programs, the market place has declared their success and made themselves known as an asheville staple since starting up back in 1979.
the market place is no-fuss and elegant, just what the bride-to-be deserved. wine and strong whiskey drinks flowed throughout the meal, and to no surprise we stayed long enough to shut down the place. i mean, if you can spend three hours at a restaurant, you must be having a good time, right? right! a couple of cheese plates were quickly ordered for some munching, and everything on that board was delicious. i didn’t hear which cheeses we were eating, but i had to keep asking cindy to cut some off the block for me because, well, because i have an unnatural affection for cheese. there are just so many kinds to taste and discover! i’m not helping my case, am i? moving on! we also had an order of the truffle and herb fries to share. i personally thought they were a little heavy on the truffle, but kristen loved them and gobbled them right up without any hesitation. you go, girl! our dinners arrived looking all rustic and stuff, and even though we’d had a few appetizers to hold us over, we were ready for some hearty food. i couldn’t pass up the hand cut pappardelle with lamb once i spotted it on the menu, and oh my, was i happy with my choice. the freshly homemade pappardelle was out of this world and perfectly al dente. the braised lamb wasn’t too heavy, and those mushrooms and tomatoes were rich and full of flavor. the dish is more mild with the wild ramp pesto but is still a homerun if you ask me. if you’re looking for a larger dish to fill you up, the hand cut pappardelle could be an easy option. alex had ordered the edamame to go with her salad, and she just had to share those little pods with us all. she insisted we try one, and as she promised, that edamame changed my world with its chili soy glaze and sea salt. there was something in that glaze that made it taste like they had been barbecued in some way, and we were crazy about it. a great starter, for certain. with two bottles of champagne arriving per the fiancé’s kind gesture, we toasted all evening to girlfriends and love and the promise of happiness. nights like this one are what you look back on fondly with a smile. we weren’t ready to call it a night just yet, so per kristen’s request we headed to top of the monk for some speakeasy spirits. after charming our way past the bouncer, up the stairs we went to a rather empty bar. there were folks here and there, but we nearly had the place to ourselves. how perfect! the bartenders were dressed up in their finest 1920s garb and hummed along with tunes of the era. we plopped our purses down on the couch, kindly ordered our drinks, and wound down the late evening. some of us at the bar got to watch as the upscale drinks were carefully crafted for other patrons. the attention to detail is impressive, and knowing that they freshly squeeze their juices and create their own bitters, tinctures, infusions, drams, flavored syrups, and shrubs, you can bet these creations are worth what you pay. we emptied our glasses close to one a.m. and gathered ourselves out into the biting night. asheville was the consummate host during our visit, and i look forward to coming back and spending more time in this fair city. 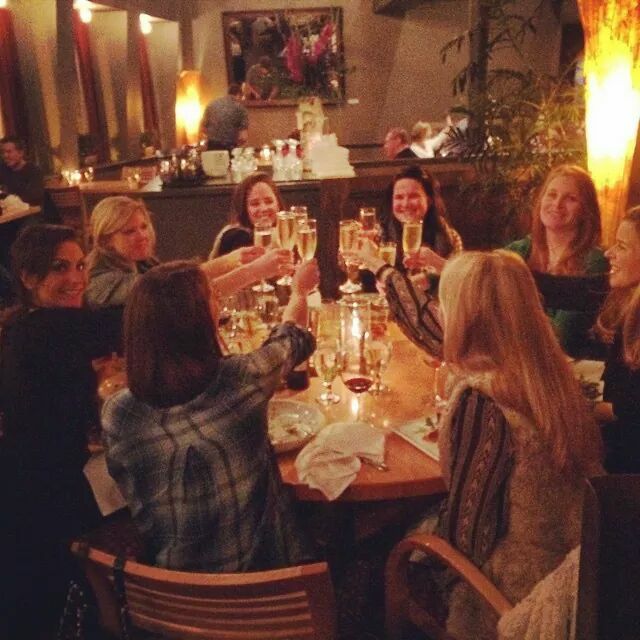 Love all the posts about our fun Asheville trip! Wahoo! It was an awesome time! The wedding will be even better, I just know it.